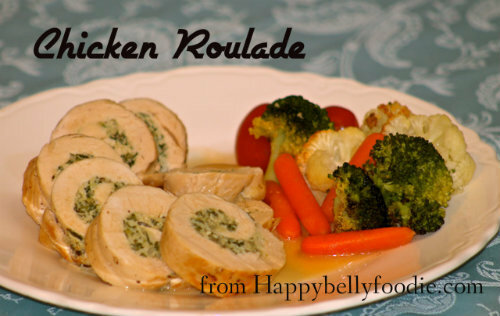 Chicken Roulade is just a fancy name for a delicious chicken dish. Don’t let that name or the fancy looking plate fool you, this is a recipe you’re gonna want to make. It’s full of delectable flavors. It’s moist and tender, just like we love our chicken. And that sauce is to die for! If you’ve ever attempted making stuffed chicken breasts and had a big disaster on your hands, this recipe will make you want to give it another try. The great fear with stuffed chicken breast is that the stuffing will ooze out and look like a hot mess in a pan. That’s not a concern here because your going to stuff the chicken with…. drum roll please… chicken. Yep. That’s chicken stuffed chicken with a little garlic and spinach mixed in. You thought it was cheese, didn’t you? Let’s get movin’. To get started, you’ll need four 8 to 9oz chicken breasts. Use a very sharp knife to carefully butterfly the breasts. Just run the knife through the center of the breast without slicing completely through. The chicken will need to be thinned to 1/4 of an inch thick. Place the breast between two pieces of plastic and pound it out with a meat mallet or the back of a small pan. To make sure each piece of chicken is about the same size, for even cooking, you’ll want to measure the length of each breast to 8 inches long and the width to 5 inches wide. Cut off the excess and reserve. That’s what you’ll be using for the stuffing. To flavor the stuffing, you’ll need a medium onion, two garlic cloves and some freshly chopped spinach. Heat a large, deep skillet with a table spoon of olive oil. Saute the onion until soft and add the spinach and garlic. Add 1 1/2 teaspoons of lemon juice to the pan, cook for another minute and place the mixture in a dish to the side to cool. Use a 1/2 cup of dry white wine (or chicken stock) to deglaze the pan. About a minute or two over medium high heat should get any stuck bits off the bottom of the pan. Pour the liquid in another dish and set aside for later use. To combine the stuffing, you’ll place the chicken scraps that you trimmed off the breasts in a food processor along with the cooled onion and spinach mixture, a teaspoon of salt, some freshly ground black pepper to taste and a teaspoon of ground thyme. Pulse until finely ground like a paste. Spread the stuffing mixture by the spoonful over each chicken breast, leaving room around the edges for rolling. Take the thinnest end and gently roll the chicken breasts into a log. Secure each chicken breast with three pieces of butcher’s twine. Be sure to cut off the tied ends so that they don’t burn in the pan. Season well with salt and freshly ground black pepper. Heat your skillet over med/high and sear each piece of chicken on all four sides. About two minutes on each side will do. Take the chicken out of the pan and place it on a platter to rest. Cover with foil to keep the chicken nice and moist. For the sauce, you’ll turn the heat up on the liquid that’s left in the pan. Add a teaspoon of Dijon mustard, another teaspoon and a half of lemon juice and half a tablespoon of butter. Allow the liquid to simmer until it’s reduced to almost half. (about 10 minutes) After the sauce is reduced, it’ll have the most amazingly scrumptious flavor. After your sauce is ready, it’s time to slice the chicken. Remove the butcher’s twine with some kitchen shears and slice the chicken into medallions for serving. Plate the chicken and serve with the sauce poured over top and a side of your favorite veggies. But seriously folks, this is a total winner in my book. Happy Belly Foodie Approved! I hope you’ll give it a try and let me know how you loved it. Butterfly the chicken breast with a sharp knife. Place each breast between two sheets of plastic and pound with a mallet to 1/4 inch thick. Measure the length of each breast to 8 inches and the width to 5 inches. Trim off any excess chicken and set aside. Heat 1 tbsp of olive oil in a large skillet over med/hi. Add the garlic, spinach and 1 1/2 tsp of lemon juice to the pan and cook one minute more. Place the mixture in a bowl and set aside to cool. Add the 1/2 cup of wine to the pan and deglaze for a minute or so. Pour the wine in a separate bowl to reserve for later. Place the chicken scraps that were trimmed off the breasts into a food processor along with the onion and spinach mixture. Add the salt, pepper and thyme and pulse until the mixture is finely ground into a paste. Spread a spoon full of the mixture at a time over each chicken breast until covered, leaving enough room around the edges to roll. Roll each chicken breast into a log and secure with butcher's twine. Cut the excess string off after the knots are tied. Season the chicken well with salt and freshly ground pepper on the outside. Place your pan back over med/high heat and add a tablespoon of olive oil. Sear each chicken breast on all four sides, about 2 minutes per side. Add the reserved wine and chicken stock to the pan. Cover and allow the liquid to come to a simmer. Turn the heat to med/low and cook for 15 to 18 minutes or until the internal temp of each chicken breast is 160 degrees F.
Remove the chicken and set on a platter to rest. Turn the heat back up to med/hi and allow the liquid to come to a boil. Add the Dijon mustard, 1 1/2 tsp lemon juice and butter. Reduce the heat to med and simmer until the liquid is reduced by half. Remove the twine from the chicken pieces and slice into medallions. Serve with the reduced sauce poured over top.